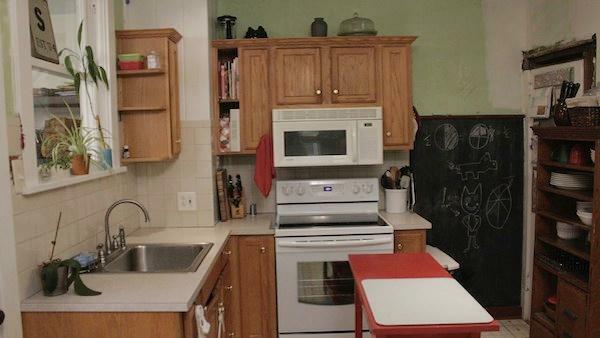 An entire kitchen remodel in less than two days for under $1,500? Monica and Jess work out how they're going to transform this kitchen into a space that scores high on style and function for a fraction of the typical kitchen remodeling cost. Geniene and her husband, Dan, started working on remodeling their kitchen when they moved into their place five years ago. But a new job with a lot more hours and three young kids have kept the couple busy, meaning no time to finish this kitchen. Geniene called on Monica and Jess to help her finish the kitchen as a surprise for Dan while he's away on a business trip. Monica and Jess have their work cut out for them in order to fix this unfinished, dysfunctional kitchen. Geniene has secretly save $1,500 for the renovation. Geniene's family has a lot of food allergies, so they do a lot of cooking. Right now, the kitchen is poorly laid out and half finished. The inspiration photos Geniene sent in show a modern country kitchen with high-end style, easily costing $20,000 each. Monica and Jess want to create a modern country style on a much smaller budget, and do it in record time! They hope the end result will be high on design and functionality. The team's first project is a big one - opening up a pass through window between the dining room and kitchen, which means knocking down part of a wall. The girls get started with demolition, tearing down the plaster and cutting the lath out using a reciprocating saw. Next, Monica and Geniene get started on making a DIY kitchen island out of a thrifted desk. Although a desk isn't something you usually see in a kitchen, this solid wood piece cost only $25, and the girls are confident they can turn it into an amazing kitchen island. To get started, they cut two pieces of MDF, one for the base and one to serve as the new top. They they add an extra set of legs to raise the island to countertop height. Then they'll paint it all one color and add a fun countertop to make it shine. New cabinets can be the most expensive item in a kitchen renovation. That's why Monica and Jess always try to work with what the homeowner already has. The remodel these cabinets, they have a fun and maybe crazy idea: wallpaper. They take the doors off the existing cabinets and plan to cover them with bead board wallpaper, which simulates the look of bead board, but for much less. They sand the surface of the existing cabinets, and then use a razor blade to cut the wallpaper to the size of the cabinet inset and use wallpaper paste to glue them to the surface of the cabinet. Then, they paint the cabinets a bright blue to unify them and a black glaze which they paint on and wipe off, giving them an aged country look. The next project in this kitchen is the countertop. With the small budget, there's no way to do high-end countertop, but Monica shows Geniene how they plan to fake the look of marble by painting their existing laminate countertop. After sanding, priming and painting the countertops, they use sponges to give some color variance and mimic the look of marble veins by using plant leaves as paint brushes. Then they spray it with water to let the paint bleed a little. At the end, it's a fantastic marble lookalike! The current floor in Geniene and Dan's kitchen is an ugly old laminate flooring. To give it an updated look, Monica and Jess show Geniene how to install a click and lock laminate flooring on top of her old flooring that looks just like wood. The result is clean, durable and gives a great country feel for less than $2 a square foot! It's Day 2 of this kitchen renovation, and the team still has a lot of work to do before Dan comes home from his business trip tonight! They made a lot of progress by relocating and reinstalling some of the couple's cabinets, adding molding around the doors and repainting the whole space a light blue, which really brightens up the room. But there's still a lot of work to do to make this kitchen special! The next project saves valuable space and is cute to look at - a built in plate rack made out of 1x2" wood and screen molding. This adds some valuable real estate to the tight space and creates a much better flow to the kitchen. With only a couple of hours to go, Monica and Geniene start on a project that will be a great focal point for the room: a vintage door. They take the couple's existing door, paint it a bold red color, and then frost the glass, adding the couple's house numbers for a stylish touch. They use a spray paint to frost the glass and use real house numbers as a stencil for the accent. There's a lot left to do in this room - installing countertops, cabinets and putting up all the cute and fun accent decor the couple has come up with. Finally, Dan arrives home, and it's time to show him the surprise! He simply can't believe the transformation and has no idea how Geniene did it! Monica and Jess appear to show how it was done. The matching trim around the kitchen only cost $190. The crew only spend $140 on renovating the outdated oak cabinets. The faux marble counter tops only cost $70, about $2,000 less than real marble counter tops. The floor, which would have been about $2,500 if they did real hardwood, only cost $430 with the lookalike laminate. The adorable kitchen island, made from a thrifted desk, only cost $45! The girls turned a colander into a pendant light over the sink and added lots of cute accessories to make the kitchen sparkle, all for only $395. An updated country kitchen could have cost the couple between $10,000 and $20,000 but the final budget for this high-end looking kitchen is only $1,360.Not only did Monica and Jess knock $140 off the budget, they saved the Geniene and Dan hours of hard work, which is truly priceless for this busy young family. See how to knock off the look of an expensive kitchen island using an old desk, creating a high-end look with plenty of storage and work space for your kitchen!